Many of our wildlife-loving shoppers enjoy putting together a collection of animal ornaments with authentic details and coloring. This African tiger Christmas ornament is a wonderful addition to any collection. It’s part of a series of African wildlife ornaments from Russell Rhodes that includes a giraffe, zebra, cheetah, lion, rhino and more. These are resin Christmas ornaments, so their durability is outstanding and the colors won’t fade. 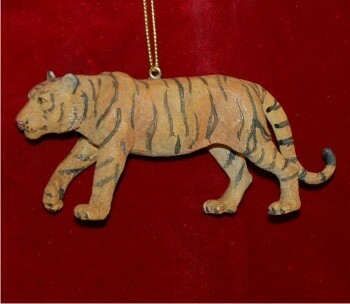 The African tiger ornament includes a display cord for immediate display on the tree or other interesting location. Our classic velvet gift and storage bag is included with your order of this authentically designed tiger ornament. Characteristics of this item prevent personalization due to the realistic surfaces.